no I don’t mean you have green smoothie in your cereal! 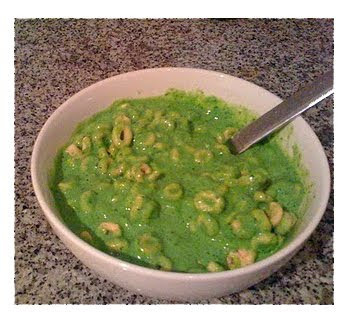 This guy in the US actually does this- green smoothie with cereal. He said it’s his new obsession- nice to be inspired to try something different- like green smoothie for breakfast. Breakfast is absolutely the most important meal you can eat when you think about energy levels, mood, hormone, stress levels, disease prevention and weight management. Which is exactly why you want to start your day…feeling the best you can feel…that’s why the most popular time green smoothies are being made all over the world by gs fans is definitely for breakfast. The healthier and more nutritious your breakfast is the MORE you will feel the impact of changes that will start to happen when you start drinking breakfast green smoothies. It will have maximum impact on your body because it’s the first food you eat after fasting all night…which is like a mini-detox- so your body wants, deserves and needs the best food you can give it for breakfast. Drink your smoothie slowly and eat nothing else until you feel hungry then have some more green smoothie. Make your breakfast smoothie thicker because it will be more filling and then you will less likely want to fill up on other food. Green smoothies are really cleansing first thing because of the greens and they are raw and completely unprocessed apart from the blending- which only helps with your digestion of all the fibre, essential vitamins and nutrients. For years I was stuck on the wholegrain/fruit/nuts/seed/milky breakfast and depending on this to get me through to the next meal- yes it was healthy and very filling but I didn’t know how MUCH better I could feel until I stopped having the oats/grains and started with a green smoothie. Yes it was definitely different at first to sitting down to a big bowl of milky mush- the taste and texture were definitely different…but after a week I was getting up CRAVING that first green smoothie of the day…and actually feeling excited about the possibilities of different combos and ingredients. I wanted more and I was CRAVING the green stuff…and of course feeling incredibly healthier and something I can only describe as an internal zinginess. Testimonials on the gs sites also describe this- it is something like energy from the food coursing through every cell in your body and brain. Also testimonials on health issues showing incredible improvement and energy feelings peaking. When I went back to the oats/grains for about 10 days as an experiment I felt blah- heavy, sluggish and had noticeable mood and energy changes- I felt like there was a big heavy weight in my stomach…it’s a lot to digest first thing in the morning and I didn’t know that digestion of solid foods can be a stress on your whole body. you know I think we are basically cynical- it’s just some fruit and some green stuff- but no it is much more than that…! It is an entire change in the way we live and have always done things. They have all the fibre and protein you need right there in the blender. no excuses-no time a factor? Get up 15 mins earlier or have the ingredients ready to go in your blender jug and keep it in your fridge until blending the next morning- this will be the best 15 minutes you can spend in your kitchen as far as investment in YOU and your body and health go… take a container with you to drink in the car or bus or train…public transport green smoothie moustaches are always a great conversation starter…!! Thankyou for your great feedback! I initially put this website together myself using my own art and photography on Blogspot. That was the easy part. When I needed to add a shopping cart to it I had a web designer do that,organise the site a little better and he changed it to WordPress. Not happy with the amount of spam comments I’m getting which didn’t happen before! Good luck. Greetings from Idaho! I’m bored at work so I decided to check out your site on my iphone during lunch break. I really like the information you present here and can’t wait to take a look when I get home. I’m amazed at how fast your blog loaded on my mobile .. I’m not even using WIFI, just 3G .. Anyways, good site! Hi that’s great! Nothing more annoying than a slow loading site. Thanks for your great feedback!